This year I was able to get a project done, which has been on my mind for quite some time: together with my fantastic Doodle colleagues and our agency friends from PerfomicsAKM3 in Berlin we launched our productivity eBook a few weeks back. Doodle as the world’s favourite scheduling application launches a book? This might sound strange at first sight, however it makes a lot of sense for us: we see this eBook as a chance to provide the many million users of Doodle with valuable insight into how time-management experts from around the world manage their time. These experts are consultants to globally known corporates, their management and also to entrepreneurs and small business managers. On top of that I personally was really lucky in meeting so many highly productive people throughout my career, while working in business centres in Germany, England, France or even in remote parts of my second home Australia. This book gives testimony of many great experiences made and I am really grateful for the openness of the experts we interviewed. With our book, we wanted to show how the world’s top productivity experts organise their day. How do these experts start their day, approach challenges and achieve their consistently high output? We know that productivity is not about how much you are doing, it is about how much you get done. And our book gives testimony of how these 30 professionals manage their time, a very personal insight into their time-management. Here is a nice summary of the technology tools the experts use themselves, most of them daily. 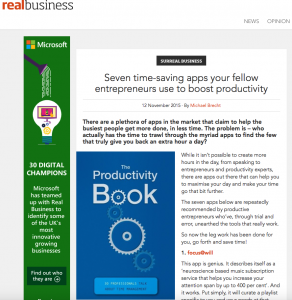 English business blog realbusiness reports on how our experts boost their productivity with digital apps, all apps are actually part of our productivity book. Very Nice!